The Android platform has quickly established itself as a dominant mobile OS for consumers. However, enterprise IT has been slower to adopt Android broadly due to lack of Enterprise Mobility Management capabilities in Android and fragmentation. 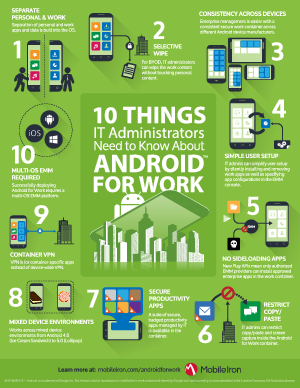 But the recent release of Android Lollipop reduces fragmentation and when combined with MobileIron enterprise mobility management (EMM) solutions, gives IT the tools needed to easily manage and secure apps and content on all types of Android devices. This will accelerate adoption of Android devices within the enterprise.